The School of Minerals and Energy Resources Engineering and the ACSMP excel in the development of Virtual Reality solutions for the mining industry. Quality education is at the heart of the School of Minerals and Energy Resources Engineering and, given this passion, we are extremely proud of our industry-inspired Virtual Reality (VR) Suite. Located within the School of Minerals and Energy Resources Engineering, the VR Suite was developed in conjunction with our industry partners for training purposes - and our students are first in line to benefit from this dynamic collaboration. Consisting of floor-to-ceiling screens, the VR Simulator - also referred to as the Advanced Visualisation and Interaction Environment (AVIE) - casts 360-degree 3D images against the dark surrounds with cinematic clarity. Staggeringly realistic underground mine and scenarios are available to be explored within this cavernous dome at the heart of our School. Within this virtual setting, a new reality opens up as you duck underneath the overhead pipes and step safely beyond the hazard zone to accompany your peers beyond the boundaries of traditional education and into experiential learning. 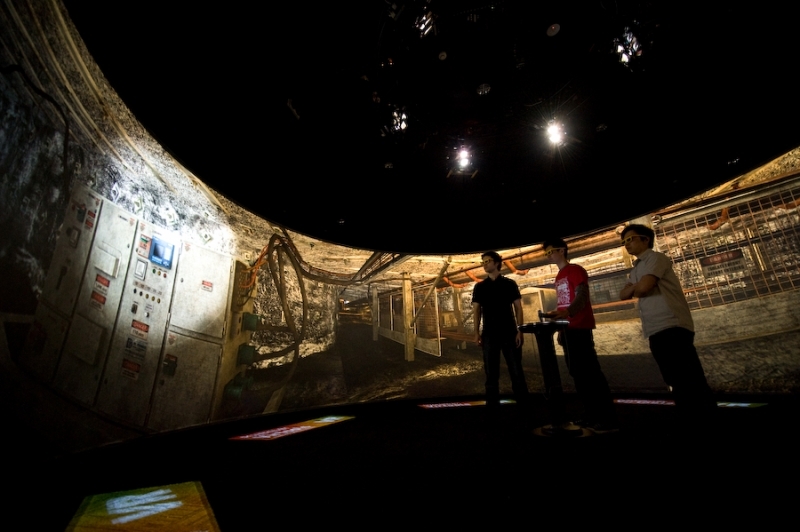 The School's first VR Simulator consisted of a large computer screen, virtual-reality eyewear and a hand-held simulator to guide students through various safety scenarios in a mine environment. In 1999, a flat-screen 'proof of concept' was deployed and subsequent funding was provided by industry through the Australian Coal Association Research Program (ACARP).This concept was further refined and successfully installed across the NSW Mines Rescue training facilities. The VR Simulator, referred to as AVIE, was developed by Professor Jeffrey Shaw's iCinema team at UNSW's Interactive Cinema Research Centre. The School of Minerals and Energy Resources Engineering immediately saw the potential in AVIE, and deployed it for student use and industry training. Industry interest in AVIE soon led to the development of additional modules over the following years, simulating a range of different mining scenarios that could be safely explored within this controlled environment. Working with both AVIE and the iDome results in a high-impact, immersive learning experience for all who enter the VR Suite. But possibly most exciting for us is the potential for our students to go beyond the textbook and the lecture hall, to safely experience unforgettable lessons first hand - creating a memorable foundation for a rewarding career. A career in mining is challenging and rewarding - so too are the environments available for our students to explore within the VR Suite. In consultation with their peers and tutors, our students can assess the feasibility of a mining project - taking into account issues around risk, economics, ore-body characteristics, equipment selection, health and safety, and staffing (among other variables). Alternatively, students can choose to step above ground to Project Manage the development of a greenfield site, where rare insights can be gained from a range of stakeholders who are projected onto the screens, larger than life. The VR Suite is also well placed to prepare our students for a variety of Industrial Training experiences that take place throughout our undergraduate degree courses, by offering these virtual mine visits throughout their degree. We believe that a sustainable future in mining also requires sustainable numbers of graduates with up-to-the-minute industry knowledge and exposure to practical experiences. This is why we are so proud of our VR Suite - it captures what we are all about, here at the School of Minerals and Energy Resources Engineering. Sensing a significant opportunity for training and feasibility testing, our industry partners have driven the development of the VR Suite since its early incarnation. A range of modules have since been developed by industry professionals to simulate various mine environments - from open-cut to underground, from hard rock to coal. Within the safe confines of a 3D simulation, potential hazards are safely experienced, evacuation procedures are tested, and feasibility studies consolidated. The scope for industry training results in a cost effective, low risk, high-impact learning experience. In many ways the particular appeal of AVIE lies beyond the obvious strength of the experiences it provides. It can invite industry professionals beyond actual reality and 'into' the ore deposit itself, for example. Within this new virtual reality, concepts and theories can be tested and challenged like never before. In many ways the VR Suite represents so much of what is important to us here at the School of Minerals and Energy Resources Engineering: innovation, high-quality education, and industry partnerships. These innovations culminate in a vision that creates industry-relevant experiences, which travel far beyond the textbook - and directly to the heart of experiential learning. Self-escape: students are presented with an emergency situation within a 3D-representaton of a longwall mine and various transport roadways. Split-second decisions need to be made while a team of miners is evacuated. Mining in a Global Environment: this module transports students to the vast blue-skies of Kakadu National Park (where they can walk through 360-degree panoramas of the Ranger Mine and its local environment) to undertake feasibility testing and to take a hands-on approach to project planning. Outburst management: this modules presents a detailed virtual reproduction of an often-fatal outburst event, allowing students to safely enter this 'worst-case scenario', trace the events that led to the outburst, and then manage their teams through the aftermath. 3D terrain exploration: students are in the driving seat for this module. They choose possible surface environments that might exist near a mineral deposit. Then an ore-body is palced underneath the selected terrain-scenario to instantly reveal the depth, orientation, dip and rock characteristics. ViMINE : The ViMINE Module 1 scenario activity is on mining methods selection for both 1st and 3rd Year students. Currently the students learn how to select mining methods through several separate activities, without the benefit of an integrated simulation. At the end of the course, the students are assessed in the form of a written report and/or presentation and in a final exam, in which they are expected to demonstrate an integrated understanding of the selection process and its potential outcomes.